This book is so inspiring and thought-provoking. It’s like a good novel – so well-written, so entertaining and engaging, I couldn’t stop reading it. It’s a must read for everyone in the world. Please, please read it…you will love it! It’s a new favorite of mine! No Impact Man is a multimedia project by Colin Beavan. 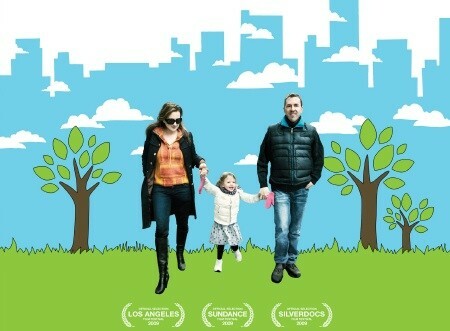 The documentary follows Beavan and his family through a full year as they try to live in the middle of Manhattan without leaving any impact on the environment. That means no electricity, public transportation, even toilet paper! This challenging experiment seems to bring his family closer together. They really stretch themselves and challenge what they’re used to in order to become more eco-friendly. They eat locally and pretty veggie …. and some friendly notes to Colin are, if he stopped the dairy he wouldn’t need to blow his nose every morning (not to mention how unhealthy dairy is in other ways…see page 34 of The Kind Diet for more info on this). And to the farmer who he says he loves his cows….it sounds nice for sure… but what happens to the cows when they’re no longer producing high quantities of milk? I’m sure he has to send them to slaughter. And what happens to the babies that the mama cows have? It is near impossible to produce milk and sell it with out getting rid of the calves. Otherwise there are too many cows to feed. The reality is the calves usually ends up being sent to be veal. I would be curious if this farmer avoids that. At my local farmers market, there are people who raise goats and love them, but when I press them on these issues, it still turns out they eventually sell their goats to someone to use for clearing weeds or what have you, and there, they eventually become meat. So, it’s still an unhappy ending for a creature you say you love….just saying. You can get the DVD here or on Netflix, and the book is available here. Share your thoughts and questions about No Impact Man in the comments below, and we’ll discuss at the end of the month! Previous Post#London2012: Gold Medal for Greenwashing?